The Skerries Coast Guard team were recently tasked to investigate a false ELT/EPIRB alert several miles inland from Skerries. The Dublin based Coast Guard helicopter had detected the false alert during a training flight and passed the coordinates to the Skerries Coast Guard team for further investigation. Shortly after 18:00 this evening, the Coast Guard’s Maritime Operations Centre received a report of an Emergency Position Indicator Radio Beacon (EPIRB) adrift near Skerries. 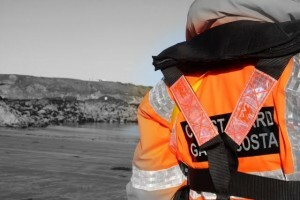 A member of the public had spotted and fortunately retrieved the EPIRB drifting at the water’s edge on the Skerries coast and immediately notified the Coast Guard. These EPIRBS are carried on vessels as a means of alerting the Coast Guard should the vessel be in distress. For useful advice and information on EPIRBS, visit the Safety on the Water website by clicking here. The Department’s Marine Notice #8 of 2006 also has useful guidance on the correct operation of EPIRBS. 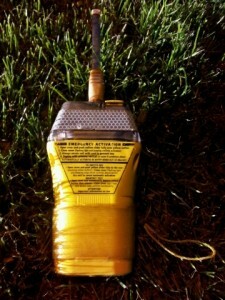 Thankfully, this was an old and correctly deactivated EPIRB and no false distress alert was transmitted. The Coast Guard did manage to identify and contact the EPIRB’s owner; a local fisherman who confirmed that the decommissioned EPIRB had been reported stolen some months previously. The Skerries Coast Guard team successfully repatriated the EPIRB with its owner. At 15:00 today, the volunteers of Skerries Coast Guard were paged to invesitgate an EPIRB distress alert near Skerries harbour. The Coast Guard’s marine rescue coordination centre (MRCC) had recieved the distress alert from the radio beacon, with the area near Skerries harbour given as the indicated position. The volunteers arrived at the harbour and located the EPIRB on board the vessal. It was evident that the distress alert was a false alarm. No further aciton was required and the Skerries Coast Guard team were stood down.